Fiction – Kindle edition; New Island Books; 157 pages; 2010. 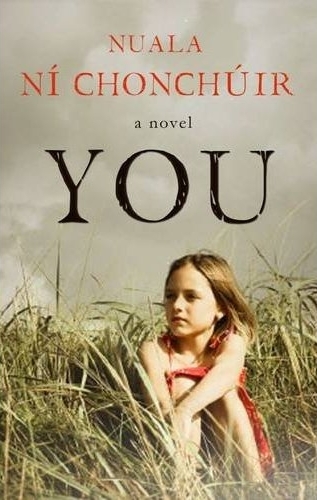 Nuala Ní Chonchúir‘s debut novel, You, is a lovely, heartfelt and completely engrossing story about a 10-year-old Irish girl grappling with issues out of her control: the loss of her best friend Gwen, who moves to Wales; the impending birth of a new half-sibling to her father’s second wife; and a new man in her mother’s life. You is set in Dublin in the 1980s and revolves around the unnamed girl, who is largely responsible for her two siblings — her younger brother Liam, and “the baby”, who is her half-brother — because her mother is partial to a drink. A couple of neighbours also help out. Every so often the girl and Liam go to stay with their dad, who lives on the other side of town. He has remarried and there’s another baby on the way. Eventually, they stay with him on an extended basis when their mother goes to hospital for “a little rest” but all the time the girl longs to return home, to her damp, crumbling house by the river Liffey, because she’s convinced that her step-mother has it in for her. You is told in the present tense and in the second person from the viewpoint of the girl, who is feisty and funny and opinionated and cheeky — and fiercely independent. Sometimes you wish that your ma was dead and that you, Liam and the baby lived in an orphanage. The people in the orphanage would feel really sorry for you and they would sing songs to you and let you sit on their lap. They’d bring you on picnics in meadows and they’d have a big basket, a checkered blanket and a flask and stuff. Then one day a rich couple would come and adopt the three of you and you would all live happily ever after in a big old house with ponies to ride on. The adoption ma would be movie-style pretty and the adoption da would be tall and handsome and he’d wear a suit and tie. Your da never wears a suit because he’s an electrician and he wears jeans or cords and jumpers. You like to think about all that sometimes, but the good feeling of it doesn’t last because the guilt starts creeping up your body and into your mind. It’s not right to wish that people are dead, especially not a close relative, even if they are narky all the time and make your life a living hell. Your ma has her good points; she just doesn’t like to show them very often. I often laughed out loud at some of the girl’s observations and at other times I wanted to cry. Much of what she thinks and feels provides great insight, not only into her own small world, which is fragmenting at the seams, but at the ways in which her mother is struggling to cope with single parenthood, depression and the fact her ex-husband has moved on and she has not. For that reason, this is a very warm and human book. Admittedly, I wondered where the narrative was going to take me, but then something quite dramatic and shocking happens mid-way through and suddenly what had been an eloquent character study is transformed into a brilliant family drama tinged by tragedy and heartbreak. You might be a short and simple story, but it’s evocative — of time, of place, of childhood — and incredibly poignant. I loved every word. thanks Kim, another interesting review. I’ve just finished The Fields, also a novel about a Dublin child, this time a boy. Very mixed feelings on that book, I’d give 5 stars to the first two thirds of the book which I loved, but only maybe 3 to the last third, where it felt forced. Just wondering if you’ve read that one? Thanks, Mari. No, not read The Fields, although I keep picking it up in book shops — and then putting it back down. I sometimes think I’ve read far too many coming of age stories about Irish children, which is why “You” turned out to be such a welcome surprise. This is such a contemporary issue, isn’t it? I’ve read any number of YA novels about kids coming to terms with new relationships, and in the end most of them are just variations on a theme, but this one sounds a bit different. This is going straight on the wish list. Her second novel comes out in April so maybe one to look out for? On a separate note, I have just finished Apple Tree Yard (bought after your post) and, goodness me, I couldn’t put it down! A brilliant read. My publisher just alerted me to your review. Wow – thank you so much! I am delighted you enjoyed YOU and, especially, that it made you laugh. I’m sure you’ll love it, Sharkell. It doesn’t take long to read (it’s only 157 pages) but it’s a memorable/devasting story. Yes, this one is quite refreshing — I think that’s largely due to the second-person narrator, not easy to pull off. Thanks for letting me know about the new novel. That will be one for me to watch out for! And so glad you enjoyed Apple Tree Yard — such a great read and, funnily enough, another one written in the second person. Thank-you, Nuala. It was such an unexpected delight to read, I really loved it. I’ve been reading through some of your Irish book reviews just now. I’m Canadian but lived in Belfast for a time in the late 90s and still like to read some Irish lit. This book sounds like something I’d like. Sadly it looks like it hasn’t been published in Canada, though. Oh well. Oh, sorry to hear it hasn’t been published in Canada. Have you tried the New Island website? I’m not sure what the shipping charges are like, but I’ve used them in the past to order Irish books that haven’t yet been listed on Amazon and I’ve found the service super speedy and efficient, complete with handwritten invoices!